Well hello! I’m Anna from Anna Mae Health and I’m new to Chaos with Coffee but I’ve been friends with Madalyn for 13 years. I’ve watched as she has put so much hard work into her career and this blog and I love seeing her thrive! Madalyn invited me to be a part of Chaos with Coffee around Christmas time and we decided starting 2019, I would contribute here and there. So I am writing this about 2 weeks ahead of my wedding day. You’re reading this shortly after it actually happens. Why? 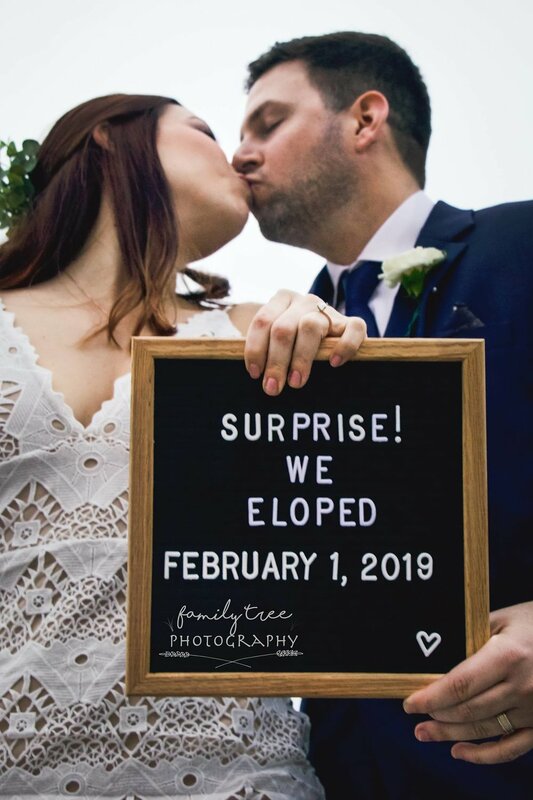 Because we eloped! Now let me start this off by saying, however you choose to get married, you should never feel the need to explain yourself or give excuses. Do it exactly how you want, whether it’s just the two of you or with 400 of your closest family and friends (lol that’s brave). No one knew we were eloping except for a select few important people. Brett (my husband!!!!!) and I got engaged only a little over 3 months ago after 3 years of dating. He and I had discussed eloping many times prior to getting engaged but were still undecided. Once we actually got engaged, I immediately started looking into wedding planning. Of course, there are soooo many options. We could run away for a destination wedding, we could just go to the courthouse. Do we invite our families? Do we include a few friends? We went through all of these scenarios. I am a planner (that’s what I do for a living plus I’m extremely Type A) so I made pros and cons lists and went through all the details of each idea. Brett’s entire family lives in Florida while mine is in Virginia. We have a few other friends scattered around the country, but the majority are in those two states. If we chose to have a wedding in Florida, the entire Virginia family would have to travel, and vice versa. Brett and I really did not want to burden so many people with that decision. So that was reason number one for eloping: distance. We just moved to Naples, FL, about 175 miles south of where we previously lived in Dunedin. We are hoping in the next few years we can save up enough money to buy a home with a really great down payment (we've been getting tons of great home-buying tips from Madalyn!). So we weren’t too excited about the possibility of spending at least $15,000, up to $40,000 and beyond for a wedding. For some, this is exactly how they want to spend their money, but for us, it just didn’t seem as important. This is where your priorities come into play. We had to decide what was most important to us, not everyone else. There’s reason number two for eloping: cost. The third reason kind of goes along with the first one. We are both Italian. Need I say more? Let me just tell you...I thought I had a big family until I met Brett. He has a very large and very tight knit family. So some people might be able to say, “I didn’t invite that cousin I barely know”. Well that doesn’t exist in our families. We were both raised very closely with a lot of our cousins and that’s only scratching the surface of the number of family members we’d want to invite to a “real” wedding! The number of people was starting to scare me. That also made it difficult for us to plan an intimate wedding. If we wanted to invite our siblings, we felt we should invite our grandparents, then we thought about one or two cousins that we’re closest with, and then it just snowballs from there. We were having a hard time drawing that line. So that’s reason number three: large families. There are a ton of other small reasons that validated us further once we made our decision, but the last reason that I’ll list is the best one. I love going to weddings. They are beautiful and so much fun. But for some reason I didn’t feel like a big wedding would feel like “us”. Brett and I are private people and love private moments together. I don’t think we really realized it before planning this, but we really love romantic, intimate memories together. I was so excited to marry him in the most romantic setting with just our parents (yes, we decided to invite them). It would be incredibly memorable and very personal to us. We both like being different and not following what’s “normal”. I think it’s really important to do what YOU want, whatever that might be. So reason number four: us. Stay tuned for details about our actual ceremony and tips for planning an elopement. I’d love to share it all finally and help anyone who may be interested but is hesitant to elope. Don’t forget to follow along over at @AnnaMaeHealth for more updates!